New York is so beautiful in the morning that it’s worth losing a little sleep to watch the sunrise spill over the building tops. If you need added incentive, this city flows with coffee. Begin your day in Union Square, watch the city come alive, and partake in some free entertainment — there’s always something going on at Union. Watch out for the ‘bad luck’ circles drawn in white chalk on the concrete: it’s like a giant game of hopscotch across the pavement. From Union, walk down 3rd Avenue to 13th street and find Everyman Espresso. This white-tiled industrial-style cafe makes exceptional,coffee; their tea is also worth trying. Both cost around $3, assuming you don’t tip anyone. After you’ve had your caffeine fix, walk across 13th Street until you hit Fifth Avenue. Wander the street, admiring items you will probably never own. When you get sick of the acute contrast between reality and dreams, grab a $1.50 bagel from a street cart and munch with vehemence. Your stomach can be satisfied, even if your capitalist instincts aren’t. One of the best free things to do in New York is museum hop. As an NYU student, admission is free to some of the city’s top museums—the Rubin Museum, on 17th and 7th, is within walking-distance and currently exhibiting Francesco Clemente: Inspired by India. If you spend $2.50 (a bagel and a half!) on a subway ride to 86th Street, you can enjoy the roof of the Metropolitan Museum of Art (donation-based entry), which affords stunning views over midtown Manhattan. Despite the bagel, you might want more to eat. Wince as you spend another $2.50 on a subway ride back to Astor Place, from which you can walk to St. Mark’s Place (8th street) and grab a falafel sandwich from Mamoun‘s. This is the realest deal in NYC: the falafel delivers crunch without grease, and the tahini is as piquant and smooth as the lettuce is crisp. The culinary experience is well-worth $3.50, especially if you have been craving a taste of Abu Dhabi. From Mamoun’s, head down 2nd Ave until you hit East Houston Street, and then follow it down to the harbor. Try to make it to the water before sunset. Then you can follow the main road to the Williamsburg Bridge and admire the scene suspended above the water. Enjoy the way that time passes, and let go of a few minutes while you confront the myth of New York City: every image feels like an iteration but also a completely new experience, from brick buildings to steaming street grates. P.S You have $.61 in change. You should have tipped the barista at Everyman. 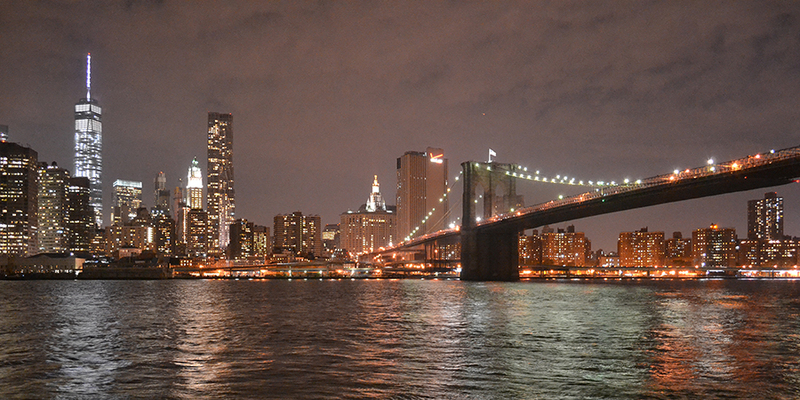 Lower Manhattan as seen from Brooklyn, with the Freedom Tower at left and the Brooklyn Bridge at right.